Lesson 1: Never assume you know what you don’t know. Do your homework. 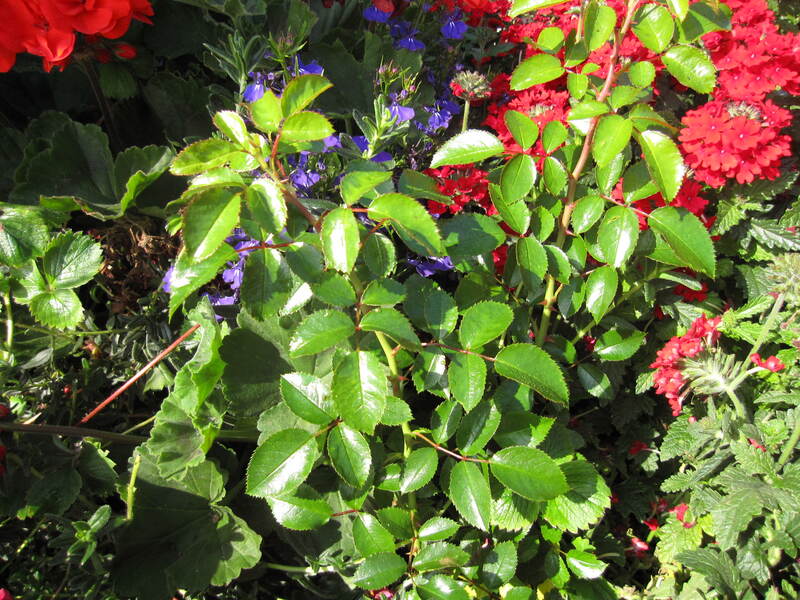 Then one day I bought this tiny rose bush in a 6″ pot simply because I liked the color of the flower in the picture on the tag. There were no flowers on the plant itself, and I had no way of knowing if A)it would actually bloom and B)if the flower would look anything like the picture–it could have been tagged wrong, after all. It sat in that little pot for quite some time out on my front porch. 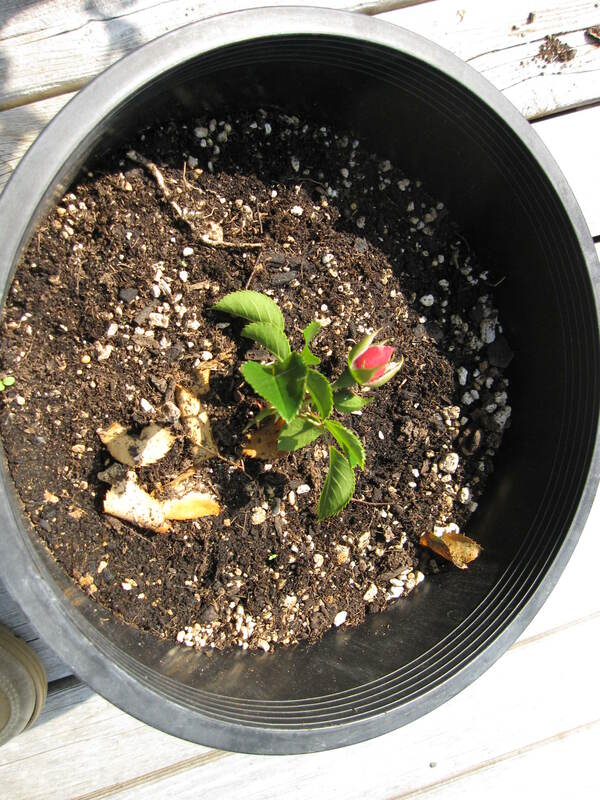 I would walk by it and wonder “Why did you buy a rose bush?” Finally out of guilt–not, I confess, over the plight of the neglected plant, but over the money I’d spent on it–I replanted it in the biggest pot I had handy. That was two years ago. Today,it’s grown into what you see in the first picture here. Lesson 2: Sometimes you just have to have faith that things will turn out and plunge ahead. 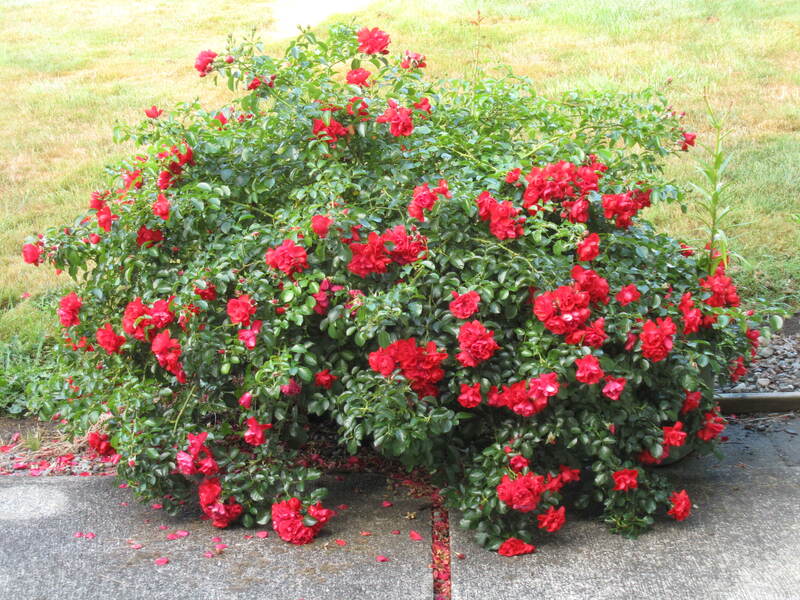 The first year, this rose got so huge it started taking over the sidewalk it was next to. I had to prune it way back. Wrestled with the thorns, wishing I had a pair of gloves that could stand up to rose thorns and at least take a swipe at blackberry thorns. Bloody but unbowed, I finally got it done. And the next spring it exploded into what you see here. Lesson 3: Edits and revisions can be bloody hell, but in the end, they’re usually worth it. 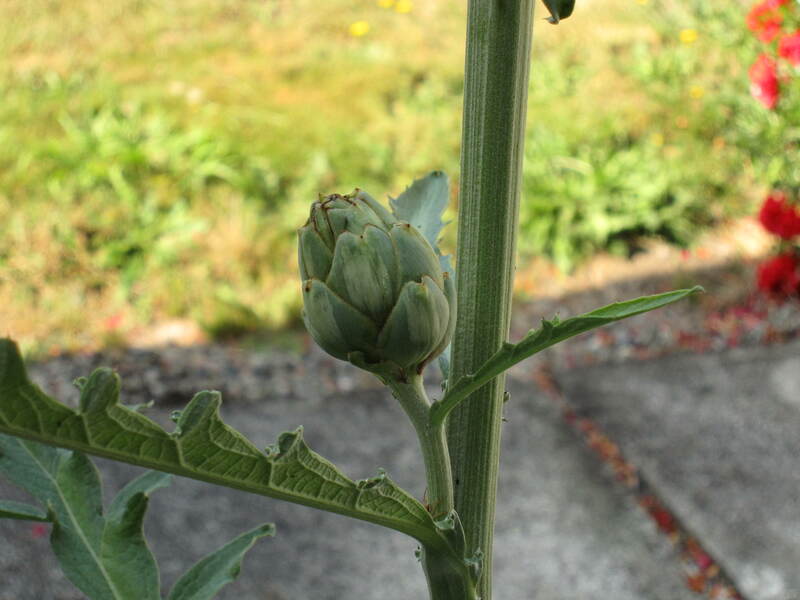 This year, while duplicating the pruning of the year before, I inadvertently cut a stem with a lovely little bud on the end, looking just about to open. On impulse, I stripped the lower leaves off and stuck it in ground in the planter, thinking it might at least last long enough for the bud to open. It looked something like this. What can it hurt to try? Lesson 4: Never throw away those little buds of ideas, because they might grow into something beautiful. pot, I knew I had to do something, even temporarily, so again I grabbed the biggest planter I had handy and plopped it in. And as is frequent with impulse buys, I then belatedly talked to my neighbor and was told artichokes don’t generally produce the first year. I was fine with that; it’s a not-unattractive plant anyway. 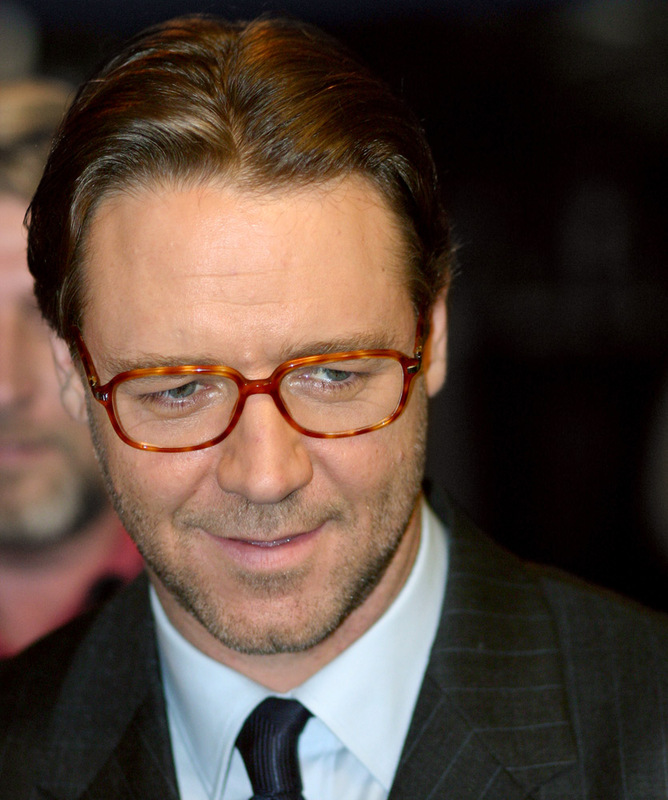 And yet…. Lesson 5: Just because they say you can’t doesn’t mean you have to listen. 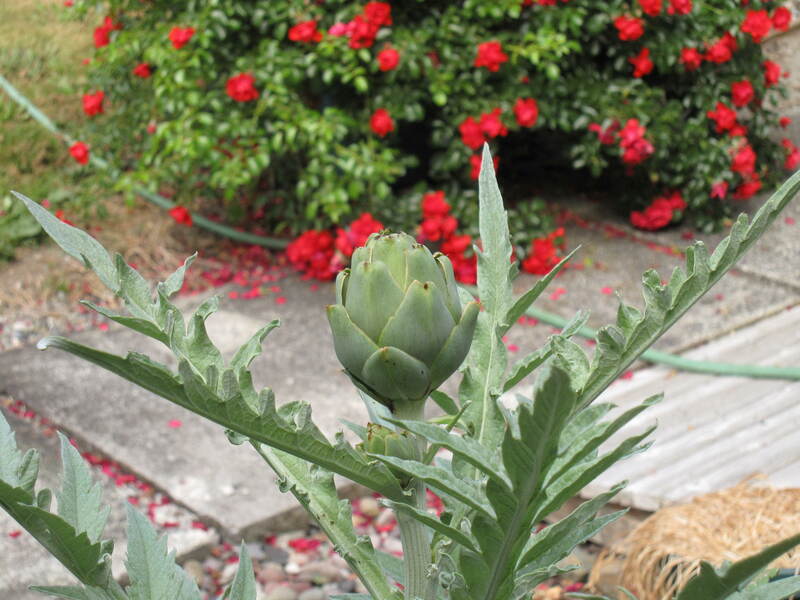 You might notice in that picture that there is a second, tiny artichoke just adjacent to the big one. The first got big enough to be harvested and actually eaten. And behind it, the second one began to grow even faster. All I needed was some room. Lesson 6: Never hesitate to use it all up on the story you’re working on now. There will be more behind it, ready to grow and harvest. These obviously aren’t all the things I needed to know. That never ends. The learning never stops, or shouldn’t. And on some level, I already knew these six, but I’ve been at this a long time, and sometimes it’s good to go back and visit the basics, lest I forget. So now, in these last days of sunshine and growing, I’m going to go outside and dig in the dirt. This post you’re reading was written quite some time ago. I was in the middle of writing the book that was released this month, so I saved it until now. But this isn’t really about the book so much as how I came to be writing it. If you’re one of my readers, then you’re likely familiar with continuity series, although you may not know them by that name. These are editor/publisher-generated, a string of books by different authors with a commonality that ties them all together. Often the connection is family, in this case, the Coltons, who have become a wildly popular fictional family. I’ve done a few of these before, even another Colton saga. It’s always a challenge to take characters and a story line created by someone else, and make them enough your own to invest the passion and caring in them that makes the romance genre work. On the other hand, it’s not that far removed from how I started writing as a child. Yes, a child. My sister likes to say she’s responsible for the start of my writing career. She didn’t buy me a fancy pen, or a computer, or anything like that. What she did was sit down and turn on an old Disney movie on TV. One of those heart-wrenching, tear-jerking things. Which inspired my elementary-school self to grab my favorite pencil (and who but a future writer would even have a favorite pencil at that age? )and some of that kid’s paper with the wood chunks floating around in it, and rewrite the entire ending. In my version, of course, every character I liked lived, and every one I didn’t went away. Kind of like I’d like to arrange my life today, if only I could. But I digress. At that age I had no concept of creating my own characters, and simply wanted the stories for characters I loved, created by others, to go my way. An early form of fan fiction, I suppose. Fast forward to today, where I’m knee-deep in a world I didn’t make up, with characters who, like those characters long ago, didn’t spring from my own imagination. It would seem difficult, and sometimes it is, but in its way, it’s much like returning to that old childhood world where I cut my writing teeth. Not that I didn’t have doubts. I had strong ones. The world these stories are set in, the Amish community, is very foreign to my experience. But I was intrigued by the idea of setting a romantic suspense story in that community. I mean, Witness worked for me in a big way. And then I have this little writer personality quirk. If you want me to darn near kill myself trying to do something just tell me I can’t. Or even get me thinking I can’t. It’s like waving a red flag. I’m cautious in most other areas of life, but in my writing I hold the firm belief that if I motivate it properly, and if I build the fictional world with enough care, I can make anything work. It’s up to the reader to decide if I’ve succeeded. I may not always, but I always begin with the conviction that it CAN be done.